Doll's Musings: Merry Christmas to all Orthodox Christians! Merry Christmas to all Orthodox Christians! It's Christmas Eve today!! Getting excited for tonight!! I can't wait to make shortbread cookies and eat one at midnight!!! That and make Polar Bear drinks with my hubby. 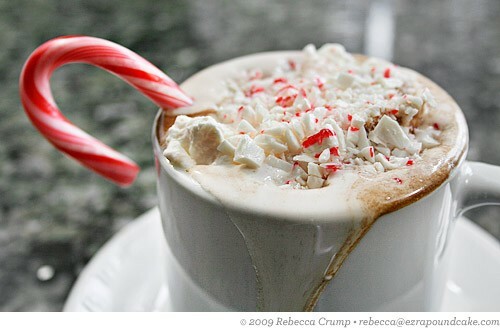 A Polar Bear drink is Peppermint Schnapps, Hot Cocoa, whip cream and a candy cane...mmmmmmmm!!! Of course, this isn't the actual drink, just a yummy photo of the Polar Bear!! After the cookies and drinks, we will open our gifts and TRY to go to sleep early...like that will happen! Tomorrow morning we will head for church then break the fast with all sorts of goodies! Then tomorrow night we will have a turkey and ham dinner!! YAY FOR MEAT!!! I've been without diary, eggs, chicken, meat, good stuff for over 40 days and I can't wait to eat all my favourite things...CHEESE!!!! I just wish I was up in Prince George with my family and hubby having the traditional weiner roast outside in the snow, in one of my dad's many fireplaces (he tends to collect fireplaces for some reason??!?!) Next year I think we will make the trip up north since I haven't celebrated Christmas with my family in over eighteen years. It's never the same here in Vancouver, even though my mom's side of the family is here, they don't all celebrate Christmas on the 7th, plus one of my cousin's birthday is on the 7th so there tends to be problems over what to celebrate. What do people do with birthdays on the 25th? Do they celebrate both birthday and Christmas on the same day?? Or do they celebrate the birthday the day before/after? I'm just curious as to what people do with that scenario. Thank you all for your kind, well-wishes for my health. My shoulder is a little better now, but I still have neck and upper back pain which prevents me from doing my favourite activities: reading and stitching. I still do both but I have to do them in short intervals. I have to say I have been REALLY enjoying reading War and Peace. Tolstoy is truly a genius and captures the Russian people to the 'T.' I recommend reading this classic to all of you if you have an e-reader. It's a lot lighter to hold than the actual book that weighs a ton!! Now here is where I'm stumped. After measuring the linen, I found that it wasn't 40 ct. fabric but must be 36 ct. and I ordered the thread pack for 40 ct. so I decided that if I stitch 1 over 2 I should be good for threads. However, I noticed that the lighter colours don't seem to be showing up too clearly, or perhaps this is just due to the bad light I have in this apartment. I'm really waffling on whether to keep going, stop and frog what I did and order more threads so I can do 2 over 2. Let me know what you think about it. I am the QUEEN of indecision!! My husband thinks it will be fine once it is all stitched and finished. I think it will be okay too, but again I don't know. As of now, I have been stitching with our camping headlights so I can see what I'm doing better!! I also haven't been out to Michael's to take a look at a floor stand to help me with this BAP!! It's a cloudy, rainy, icky day so the colour of the fabric looks a lot grayer than it actually is! Titus helping me chart the 10 by 10's! So cute!! As for Titus, he is quite the munchkin!! 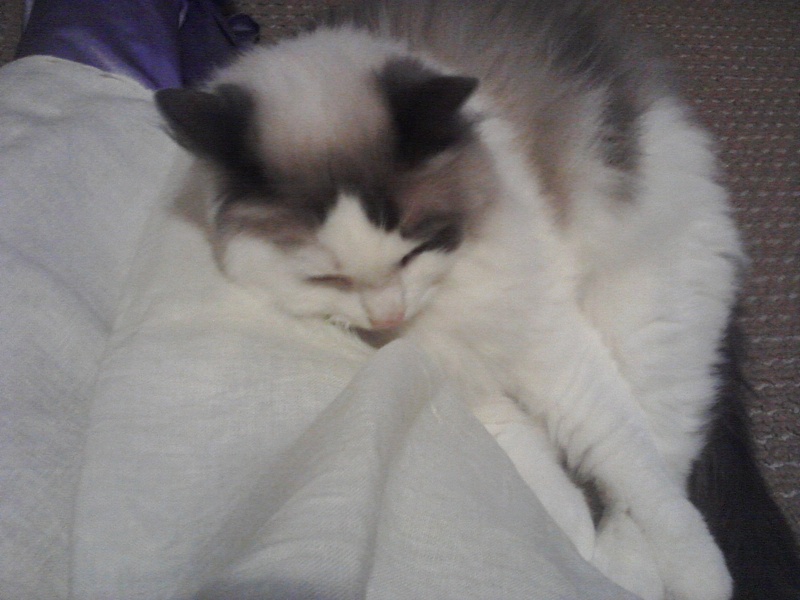 He is WAAAYYY to interested in my stitching and almost pierced my Jane with his claws!! Luckily, I was able to move the puncture wounds in Jane around and now the fabric is okay, but from now on, I have to place it far away from any more accidents!! My birthday was a nice quiet day. My hubby spoiled me with a gorgeous Amethyst necklace and some wonderful black, satin pajamas and an amazing sushi dinner at my favourite restuarant! I actually had a whole soft shell tempura crab!! I didn't know it was the whole crab, until my hubby said, "Don't look down at your plate!! Remember this is tasty!!" After I ate it, I saw what was on my plate, and it was some of the insides of the crab that had leaked out! Mind over Matter!! Mind over Matter!! It was really good, but I think I'll stick to eating just the crab legs and claws thanks!! 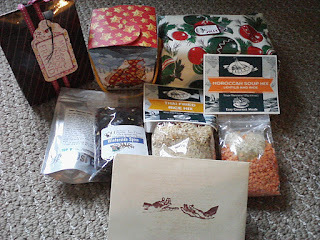 My lovely friend from Prince George, whom I've known since Grade 2, sent me a massive Christmas/Birthday parcel. She always gives me the most amazing gifts! I finally sent my parcel to her and I hope she enjoys her gifts too. She is so talented with card making. 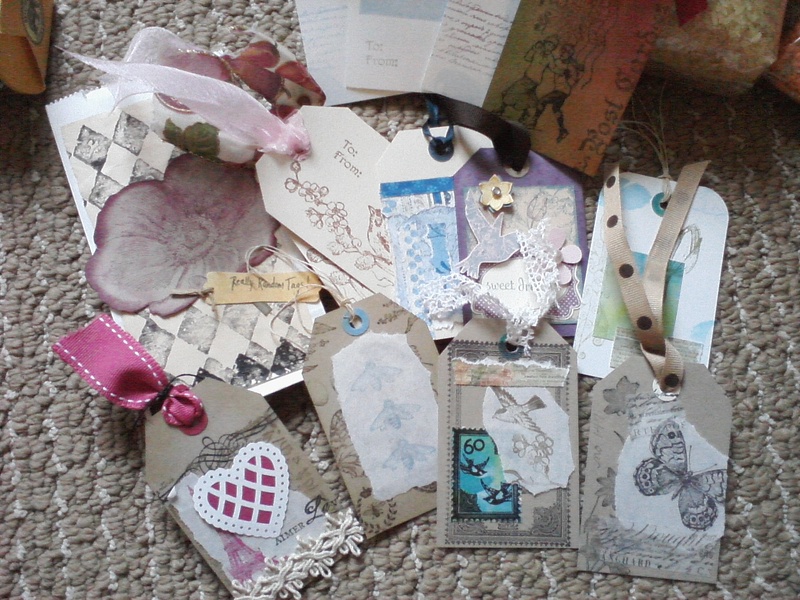 She sent me the most amazing gift tags that I can use for gifts! Take a look!! Okay, so I need to go about getting my cookies together now! Thank you for visiting and hugs to you all!!! Happy Christmas to you! I didn't realize the difference in time for Orthodox Christians. Your Jane. Hmmm. It's sort of hard to tell how hard it is to see the colors. The flower looks fine. Those little branch offs might get lost, but hard to tell at this point. Is it super hard to see when you're stitching it? It might totally blend in if that's the case. If you can see it pretty easily while stitching, it might be just fine. Sounds like you had a nice birthday too! Happy belated birthday! Have a Happy Christmas. I didn't know that some religions celebrated it today. Sounds like you have some wonderful traditions. You seem very happy even with those lingering back and neck issues. Amethyst necklaces and satin pj's can work wonders! 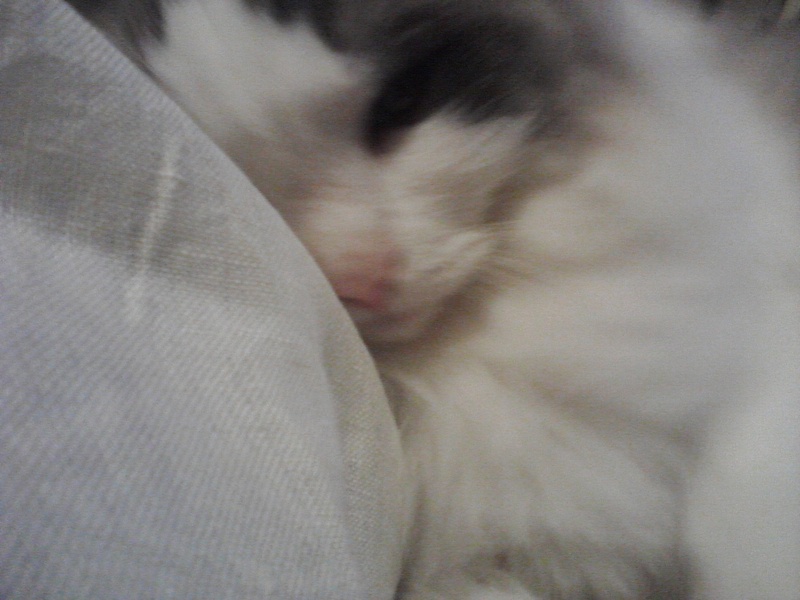 It's hard to tell from the picture but I think you'll be okay. You probably need more colors around it to really get a good feel for it. Happy Christmas! Growing up, we commemorated January 6th as 'Little Christmas'--haven't thought of it in quite some time! Just looked it up, and it is an Irish tradition to celebrate the Epiphany... Makes sense since we are mostly Irish! Enjoy that drink--it looks yummy! Hugs! I think Jane looks great! The cream is light but you can still see the flower...the cream vine is a little harder to see but it's also not so noticeable on the cover photo. I think it's fine! Glad to hear you had a nice birthday! I hope that you have a wonderful Christmas celebration. Enjoy everything. It also sounds like you had a wonderful birthday. What lovely gifts. Jane is huge but she is going to be beautiful. Jane Philpott is a wonderful sampler. Love that one. 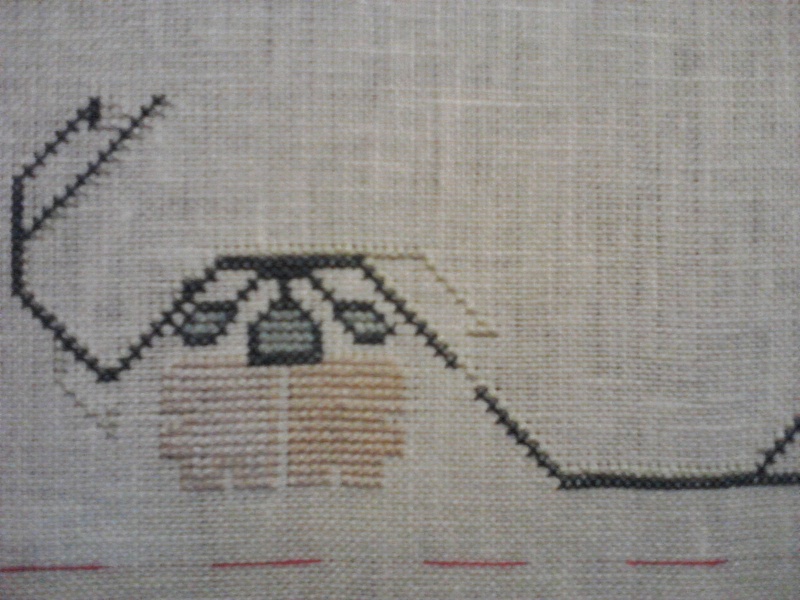 If I'm not mistaken, the sampler was meant to be stitched on Homeshpn? Which is also a rather light color. I think it is meant to look like that. It's hard to say from a picture. Merry Christmas - have a wonderful day. Your DH sounds like a lovely, supportive husband. Merry Christmas. Happy Belated Birthday. Look forward to seeing your new start. Great gifts received. happy belated birthday..big hugs for you..
very beautiful gift you received..
happy stitching with your new start.. Happy Christmas! From the photo it does not seem to be bad choice, but if you feel it is not nice enough for you, it is better to frog now than later...Especially with a BAP it is important that you like the whole piece, otherwise you will loose your mojo! And in case the floss is not enough, you can buy some later, maybe it will done for 36 ct as well. 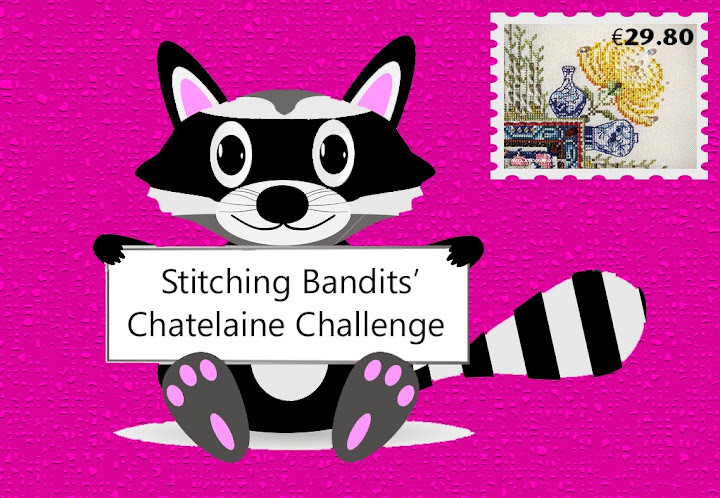 And i hope you will be better soon, i know how difficult it is not to stitch! Merry Christmas to you Anne! We always leave our tree up until Orthodox Christmas or the Feast of the Epiphany for those of us who are not Orthodox. I have got to try one of those Polar Bear drinks. Mmmmm, yummy! It sounds like you had a lovely birthday celebration. I'm glad that you enjoyed your day. We celebrated the Feast of the Epiphany yesterday, it's also Nollaig na mBan which is when traditionally the women take it a bit easier, having done all the work over Christmas! LOL I am loving that tradition!! We went to Mass yesterday morning. As for December 25 birthdays--my brother was born on Dec 25 and decided that he is Jewish. I know it's what he believes in his heart (that plus his wife is Jewish) but I always thought it was ironic. Anyway--Happy Christmas! It sounds like you had a wonderful birthday with lots of nice gifts! On the sampler... if you are having misgivings now, I would go with whatever you think might be better. I say that because I have a few projects that I started, didn't like the coverage, and kept going--but don't like working on them because I'm not happy with how they look. Jane is a BAP and if it were me, I'd want to use what I thought would keep me working on her. Just my humble $.02! I think it looks good, though! I'm okay with one strand of silk on 36 ct, it's one strand of DMC on 36 ct that starts bothering me with the coverage. I know others like it--it's just me--I use a fairly tight tension. Have a wonderful Christmas celebration. 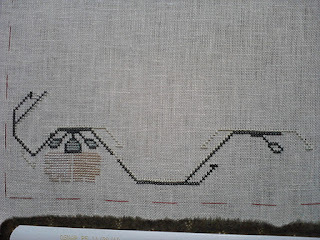 It also so hard for me to decide if the linen color is too dark or light for my piece. I am sure your will be just fine. Sorry to hear about your injuries. I am just now getting back to reading blogs. I so feel for you as cramps got me down each month. Go eat some of your cookies and hope you are feeling better real soon. Anne, first off, Merry Christmas! I hope you have a feast tonight! I'm sorry to hear about your neck and shoulder pains. I can totally sympathize!I hope you feel better soon! As to Jane, I don't have the chart so I can't see what was intended (eg whether flowers s/b light). For me, personally, I would want a brighter colour. However, like Siobhan said - whatever makes you feel more comfortable - do it now! It's a BAP and you sure don't want to be uncomfortable and/or changing colours later on! Happy Birthday and Happy Christmas! It sounds like you had a fun time and I'm glad you're feeling better. Merry Chritsmas! I hope you had a lot of fun celebrating! We're Orthodox too, but celebrate on 25th. Hmm and about those who have bday on 25th, well I have one friend whose boyfriend was born on this day, and she always gets him only one present, poor guy, lol! Oh, and that Polar Bear is yummy! Merr Christmas and Happy belated Birthday!! This drink looks very delicious! Happy belated birthday! I hope you have a special christmas.. I want one of those hot chocolates that sounds so yummy! I think your thread and fabric will be fine! Happy Christmas, Anne, and Happy Belated Birthday. I could just drink the hot chocolate right now. It looks yummy! 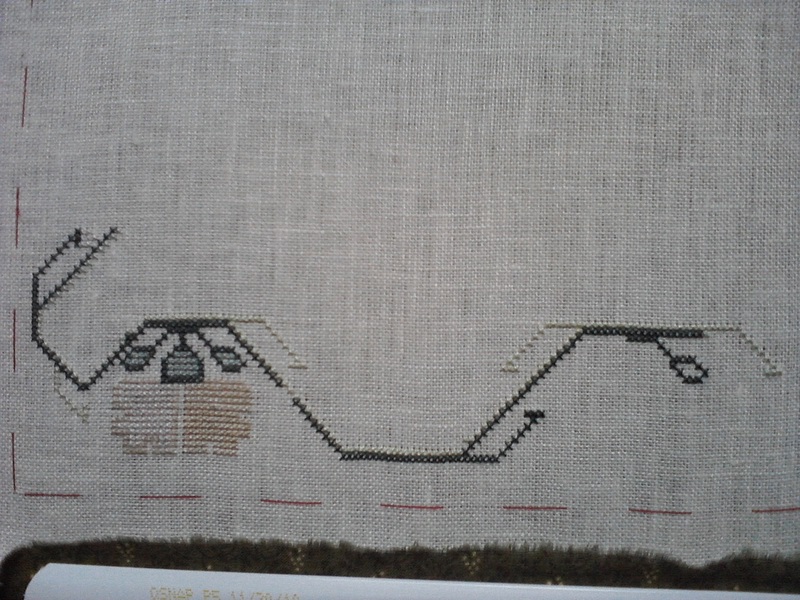 From what I can see your sampler looks like it will be fine although as Siobhan says if you are unsure you may want to change it. I always find it hard to decide! I'm sure you had a joyous Christmas, Anne. Hopefully, you can be with your family next year in Prince George--it does sound like you have some wonderful traditions. My Grandmother's birthday was on the 25th and all I remember was her piles of gifts for both her birthday and Christmas. She would sit there like a queen on Christmas Eve carefully opening each one! Sure hope that darn neck and back pain dissipates quickly--that must be a terrible inconvenience. Titus is so sweet--how I miss having a kitty around the house! I also think that you should do what you think is better, it's a hobby and should be fun :). Merry Christmas, darlin'!!! Did you have an awesome day? I agree with Lee.... the lighter colors will show up once the other colors go in. Also, right now you're looking at it a small scale and it's hard to see the big picture. I think using 1 strand is going to give the lighter shades a nice lacey effect. A Decision Is Finally Made!